For apartment-dwelling kids or families who have limited space, traditional pets might not be a great fit. Reptiles, however, typically live in self-contained environments that require a relatively small space commitment. 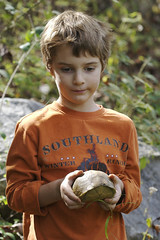 While not all reptiles are ideal choices for kids, there are many that could prove to be perfect for your family. 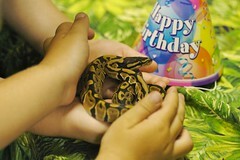 Here are 10 of the most kid-friendly pet reptiles. 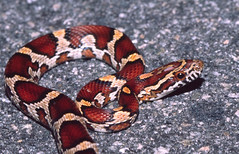 Corn Snake, SE Georgia, USA (Photo credit: TomSpinker) As a general rule, snakes require significantly less space and attention than many other types of reptiles, making them ideally suited to live in a tank inside an easily-distracted child’s room. The slender bodies of corn snakes are easy for children to handle, but be warned: they can also be masters of escape if housed improperly or if the lid to their habitat is left unlatched. Roger and Paul Sharing a Ball Python (Photo credit: bbum) For kids that want a snake with a heftier body, the Ball Python might be a good choice. The humidity and temperature of their habitats do need to be carefully monitored, but they’re relatively low-maintenance pets that are typically very tolerant of excessive handling. 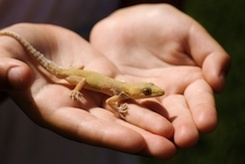 English: Leopard gecko example (Photo credit: Wikipedia) Hardy and tolerant to handling, the leopard gecko’s diet of insects, vegetables and greens is easily acquired and can be handled by an older child without much assistance. The biggest drawback to the leopard gecko is its nocturnal nature, which can cause kids to become less interested when they discover that it sleeps for most of the day and is active at night. Bearded Dragon eating a pear slice (Photo credit: Wikipedia) One of the most popular lizards for children’s pets is the bearded dragon, which can grow up to two feet long in adulthood and subsists on a mixed diet of insects and vegetables. Bearded dragons typically have good personalities and are well-suited to children. African fat-tailed gecko (Photo credit: Wikipedia) Generally quite docile and easy to tame, the fat-tailed gecko is another suitable reptile for children, and their 10 inch average size is easy for smaller hands to accommodate. They are also very tolerant to regular handling. They typically live for 15 to 20 years, so you’re not likely to have to handle the delicate subject of death when your child is still too young to process the concept properly. Fire-bellied toad – Bombina orientalis (Photo credit: Roberto Verzo) Despite their ominous-sounding name, the fire-bellied toad can be the perfect pet for a frog-loving child. They also can survive comfortably in a smaller environment and are generally less expensive and less difficult to keep up than other types of reptiles. 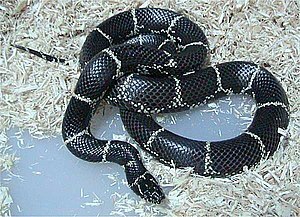 Eastern Kingsnake, Lampropeltis getula getula (Photo credit: Wikipedia) Slower-moving than many of their snake relatives, the king snake is small and quite friendly. With proper handling, the king snake is far less likely to bite than other species, and is also much easier for children to hold securely. Box Turtle (Photo credit: bbum) These turtles have acquired the reputation of being quite easy to care for, which is sometimes true and sometimes not. Their disposition typically depends on the area in which you live and whether or not the box turtle is a naturally-occurring species and if you plan to house it outdoors. If your accommodations are adequate and you provide proper care for your new box turtle, it can live for a very long time. It is very important, however, that you make sure that the turtle you’re purchasing was captive bred; laws governing the sale of these reptiles have caused a huge spike in the capture of wild adults, which is rapidly diminishing the number of these creatures in their natural habitats. Crested gecko (Photo credit: Wikipedia) Less finicky about heat than some of their lizard brethren, the crested gecko does require a vertical cage to accommodate his ability to walk vertically across a surface. Though the crested gecko is another nocturnal lizard, their relative ease-of-care makes them one of the better choices for kids. English: Commons:Category:Anolis carolinensis (Photo credit: Wikipedia) Though their five to seven year lifespan is significantly shorter than those of many other lizards, the anole is quite small and can change colors from green to brown. Docile after taming, they can tolerate capable handling once they’ve become accustomed to it, though they are easily frightened in some cases. It’s important to carefully research the habits and needs of a particular reptile before bringing it home, as there are many factors that make specific creatures less than ideal for kids. Some, for instance, can become so stressed from frequent handling that their health is affected. Also, children that are too young to understand proper hygiene should never handle a reptile without adult supervision, as some varieties can carry the salmonella virus, which can be easily spread if kids don’t wash their hands thoroughly. Be sure to take your time before making your decision to ensure that both your child and their new pet are happy and healthy. Thanks to Carol Watson of National Nannies for this very informative article! Please visit my web site at Pet Portraits by Deena and see the many portraits I have painted (although no reptiles yet! )â€¦10% of proceeds goes to support CorgiAid.